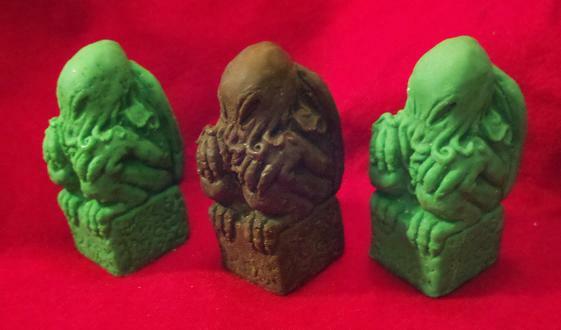 Chocolate Cthulhu Idols « Gluttoner: You gonna eat that? Get your chocolate Cthulhu‘s now! Made of solid green chocolate, these 3 inch tall pieces of weird chocolate are being created by Jason McKittrick in a limited production run for $10 a piece. If you don’t know who Cthulhu is you’re probably better off- it’s a fictional cosmic entity created by horror author H. P. Lovecraft in 1926. I would have ordered some of these had I been able to find an order button to click on.